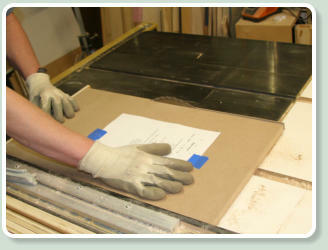 The enabling technology of gluing wood veneer tightly to cabinet doors is a vacuum bag. 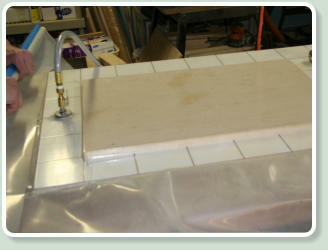 This is a vacuum pump connected to a plastic bag that holds the door with the freshly glued (still wet) veneer in place. 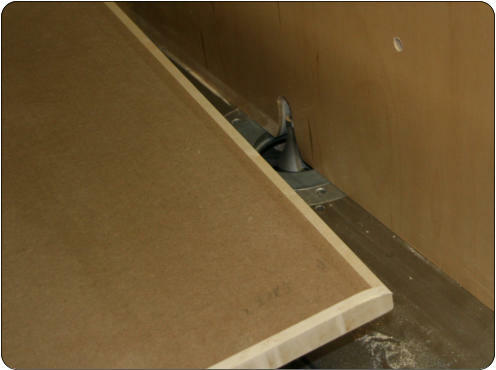 The result is like a ton of weight evenly distributed on the veneer, bonding it permanently to the substrate door. 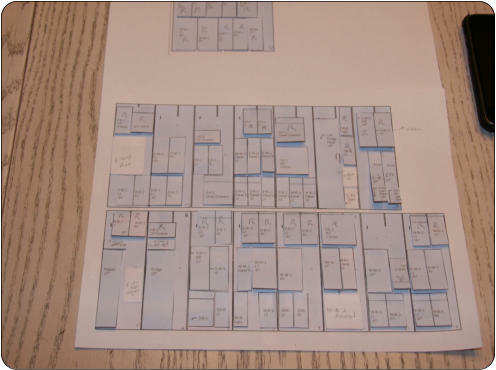 The same Excel Spreadsheet with rows for each cabinet also has columns calculating the measurements for each door and drawer front. 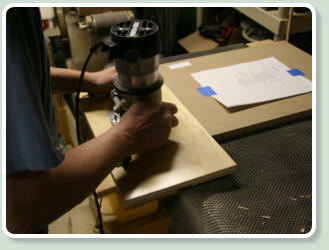 For each sized part, there is a definite series of steps with various cuts and trimming that have to be done in order. 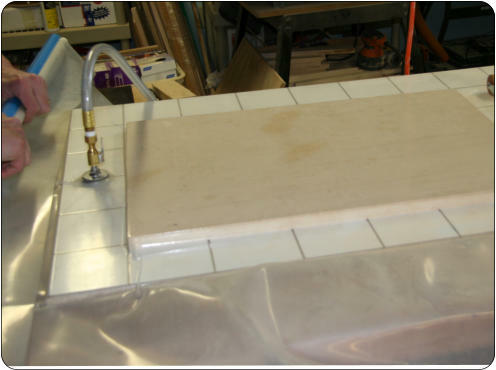 The only way to get this right in this size of a project is to generate a custom checklist with detailed measurements for every single piece. 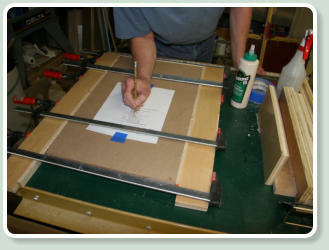 I used several veneering books including: “Veneering: A Foundation Course” by Mike Burton and “Woodworker's Guide to Veneering & Inlay: Techniques, Projects & Expert Advice for Fine Furniture” by Jonathan Benson. 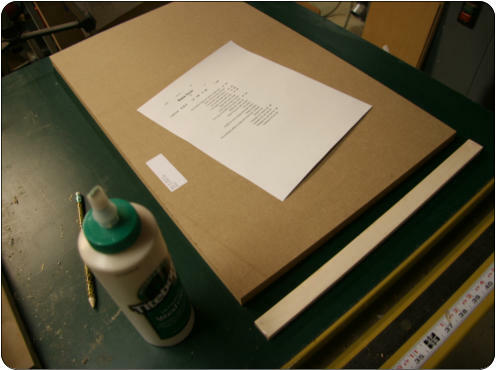 Here is a strip of maple about to be glued on the MDF substrate. 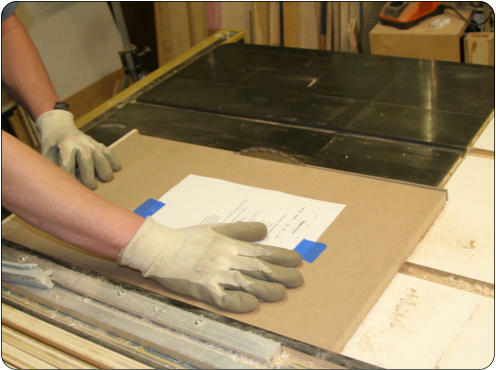 The substrate is trimmed on the one edge only. 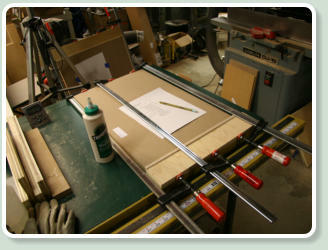 Other edges will be trimmed just before their strips are to be glued. 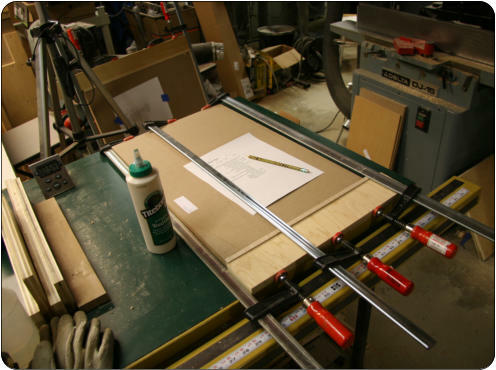 The side strips are then glued and clamped. 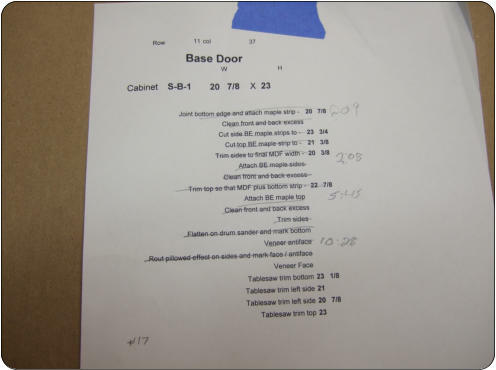 Note the bookkeeping on the checklist. This is very important to avoid mistakes especially when dealing with fractions of an inch. 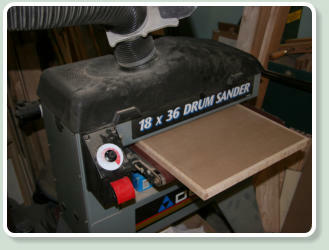 ...and trimmed using the router surface jig. 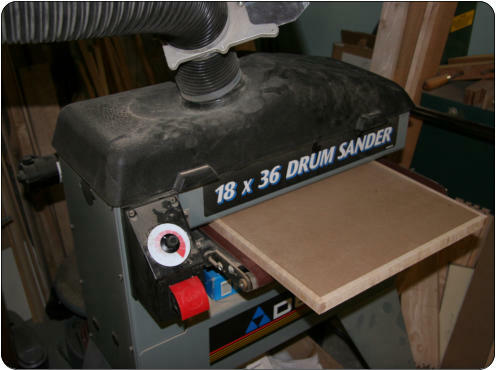 After the top edge is glued on, final trimming is done on the drum sander, which leaves the assembly perfectly flat and ready for veneer. 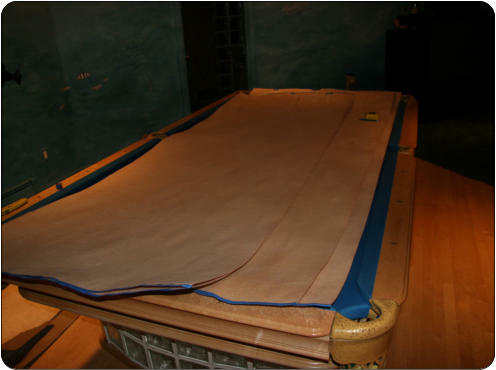 Glue is rolled on. 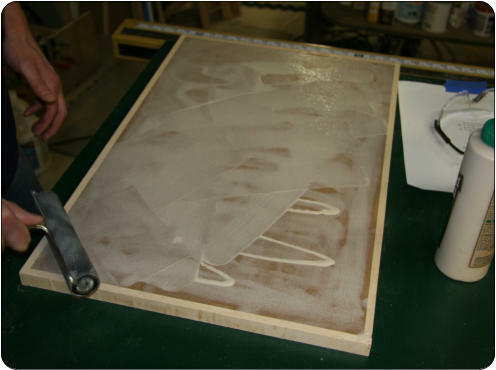 This has to be done quickly as this particular glue starts drying rapidly. 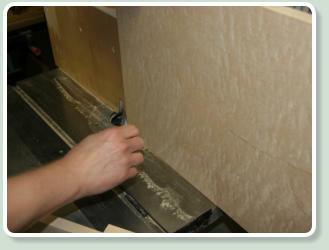 Also the veneer curls and expands (at least 1/4”) immediately when contacting the wet glue. Later on, we discovered that using Urea Formaldehyde glue such as Uninbond800 made the assembly WAY easier. No expansion and plenty of open time until you apply heat to cure it. 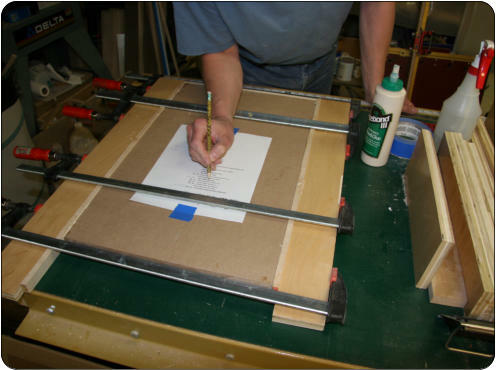 It’s important that both the substrate and veneer are marked lightly in pencil for which way is up and which side is the face versus the rear of the panel. 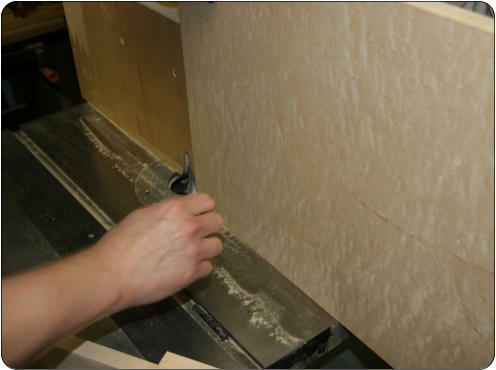 The whole point of buying the veneer lie we did is to get each panel to have grain flowing into the panels adjacent to it. Into the bag it goes. 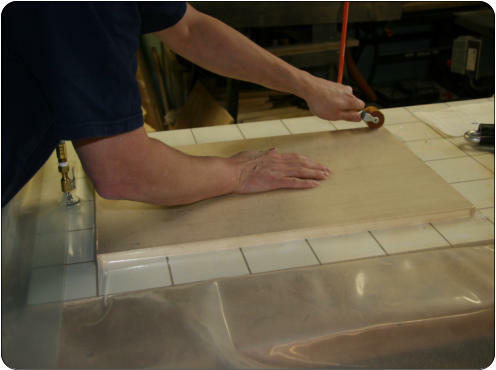 The vacuum pump is strong enough to get small wrinkles out quickly with a little help from a wooden roller. The finished profile. 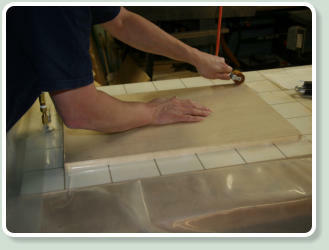 The veneer will have no problem curving around this edge. Note the writing on the panel to show which way is up and also that this is the face (not the rear) of the panel. 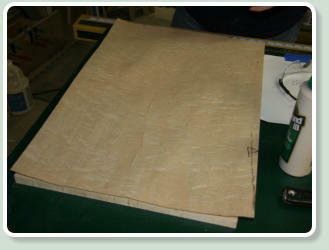 This will not show through the veneer and I can’t stress enough the importance of marking everything. 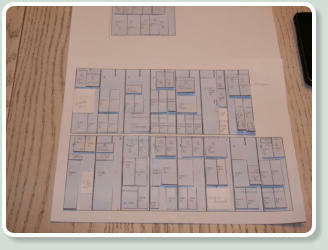 ...And I bought 17 of those sequential sheets! 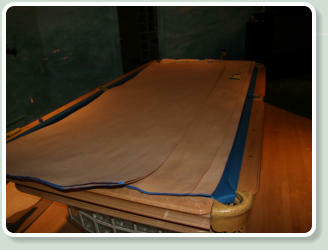 Most of the sheets are 110” long by about 37” inches wide. 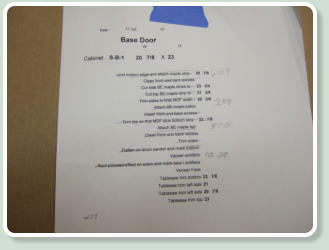 This means that every cabinet door that I made had no seam on the front or back. 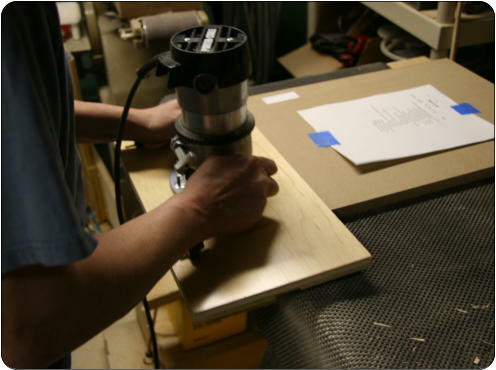 It also means that base cabinet double doors and the two drawer fronts above them will have the wood grain running continuously. You don’t get that at Home Depot. Where do you get that? 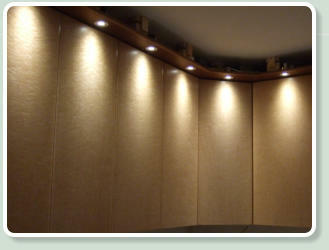 This is similar to the cabinets themselves. 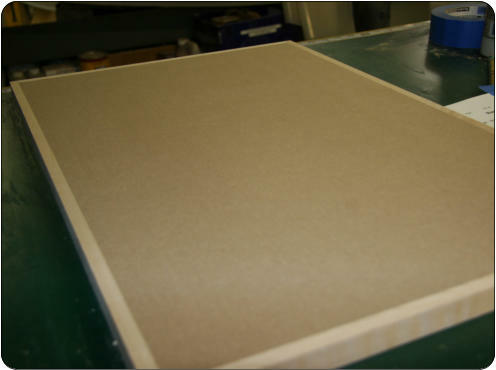 Each part is mostly made of smooth-as-silk medium density fiberboard, or MDF. 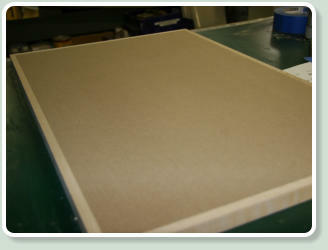 It takes glue really well and is considered an optimum substrate for veneer regardless of cost. 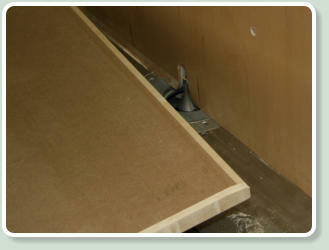 As in cabinet part construction, this means that the edges need to be faced with solid maple on all sides. 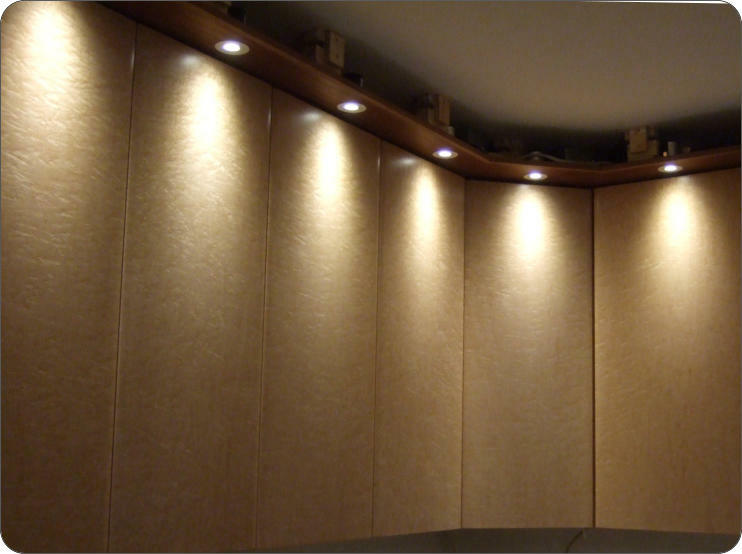 Back to the cabinets. 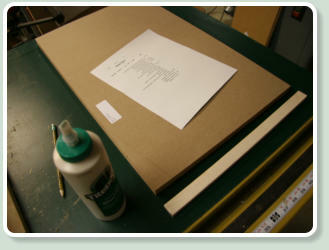 Figuring out where each piece of veneer should be cut took some planning. 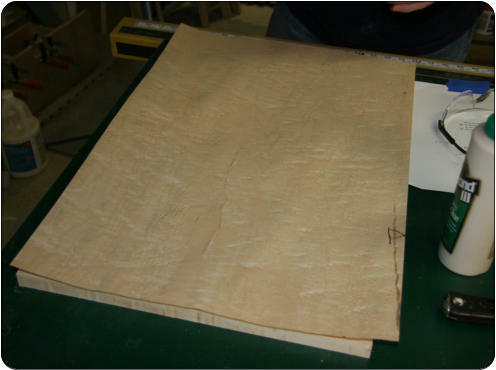 Above is the scale model of the veneer strips (with defects marked so that I can avoid them). No mistakes allowed! 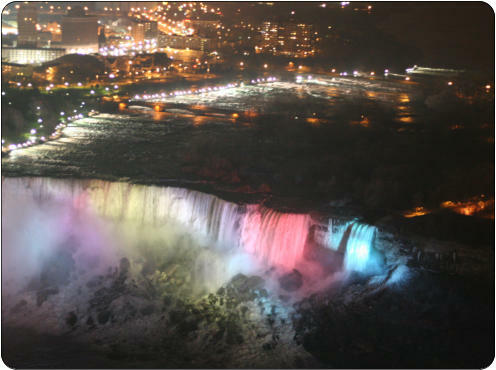 Niagara Falls! Well close. 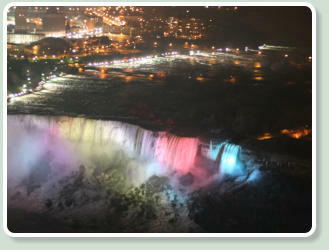 This is the Canadian side, but about 40 minutes away on the Buffalo side is “Certainly Wood”. They are worth the trip to East Aurora, NY. While there, eat at the birthplace of the Buffalo Wing - The Anchor Bar.